That's one descriptive title, isn't it? I've loved coffeecake all my life, but only certain types. No berries, thanks. Yes to apple or rhubarb. Sour cream makes it so nice and moist. But always, always, it's really about the crumb topping. A while back I found a great rhubarb coffee cake recipe that fully addressed the crumb topping issue. But I can't leave well enough alone so I tinkered with it a bit. When I went to make it today rhubarb wasn't in season and I couldn't find any frozen rhubarb. Hence, this amalgamation/refinement. Also--I don't understand why anyone ever makes a 9x9 coffeecake. 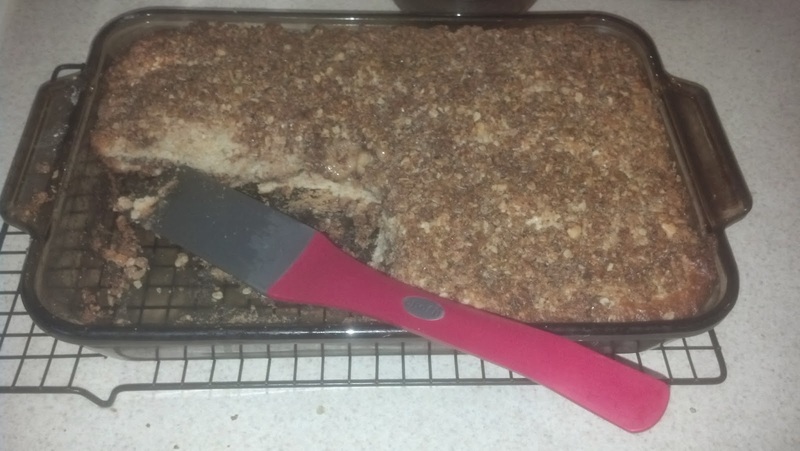 Why go to all that trouble for just a couple of days of coffeecake? (At my house, at least, where my bike-racing husband runs a nuclear power plant he calls a metabolism, a 9x9 coffeecake doesn't last long.) So I always double coffeecake recipes. I've learned that this more than doubles baking time so keep an eye on this and test with a toothpick. The recipes linked above are for a 9x9 pan. * Whole wheat pastry flour is my preferred baking flour. It behaves like all-purpose white flour but gives you more nutritional bounce for the ounce. ** Feel free to use reduced-fat sour cream/yogurt, and vanilla yogurt would add a nice touch. If you like fruit in your coffeecake I suppose you could use fruit yogurt but I won't vouch for it. Cream together the butter and oil, sugar, and eggs. In a separate bowl, mix together the flour, baking powder, baking soda and salt. Add the flour mixture to the butter mixture alternately with the sour cream or yogurt, stirring after each addition. To make crumb topping, mix sugars, spices, and salt into melted butter, then stir in flaxseed, walnuts, oatmeal, and flour. Leave it pressed together into the sides and bottom of the bowl. Grease and flour a 9x13 baking pan. Spread half the batter in the pan, and lay half the topping mixture over it with your fingers in chunks of 1/2"-3/4" (don't stress over the size--just go for chunks). Repeat with remaining batter and topping. Bake at 350 degrees for 60 minutes, covering it halfway through with foil to prevent the topping from over-browning. Test with a toothpick. If it doesn't come out clean, bake another 10 minutes and test again. It may need another 10 minutes; oven temperatures do vary. I wasn't going to immortalize this exchange because it's the kind of thing I'd rather forget. It didn't add to the stock of positive energy in the universe, except maybe a very little, at the end. I couldn't tell. But then these three quotations came my way and I thought I'd tell the story. Maybe one day when you're inclined to snap at a stranger you'll remember this instead of your mom's admonition about sticks and stones. I was riding home from work on the Burke-Gilman Trail, heading toward north Seattle. The trail is great but lacking in signage in a few places to tell you what street you could get onto if you left the trail at a particular spot. In several places the street that intersects the trail has a name, not a number, so you don't know how far north you've gone unless you've memorized the map or you pull out your smartphone. Thus it was that I left the trail at a paved intersection with a quiet street, knowing I'd passed the spot where you can leave the trail around 93rd but not sure whether I'd gone as far as the streets that climb, brutally steep, toward 123rd, which I wanted to avoid. The streets I faced had names, not numbers, and wound fairly steeply upward, but didn't seem to be as bad as I remembered being the case at 123rd the one and only time I've encountered that spot. I was pushing my bike as I climbed to the intersection of what proved to be Exeter St. NE and 113th, where a woman stooped, working in the yard of the house at the southeast corner. She straightened her back to look at me. "Is there a way to get up and over?" I called, gesturing over the hill behind her. "What do you think?" she said abruptly, pointing to the Dead End signs. Taken aback, I responded, "Well, I just thought I'd ask." "Yes," I replied patiently, already turning to push my bike up the hill to my left, away from those signs and from her. "It's just that sometimes they're a dead end for cars but there's a way through for bikes." From behind me I heard her say sarcastically, "Only in Seattle." I pushed my bike a few more yards, then called out, "Have a nice day!" A bark of laughter came from behind me--whether she was startled into recognizing how her tone had sounded or laughing in disgust I don't know. I pushed my bike to the top of the rise in front of me. As I prepared to mount and keep climbing I hesitated, thinking about going back to introduce myself by name and explain that I'm still relatively new to that part of town and learning my way around. I thought that perhaps if I put a name on the encounter she might not react that way to the next person with a bike who climbed that hill and asked her for directions. It's so much easier to be mean to someone in the abstract than when the person is right in front of you holding out a hand, so much easier to see a label rather than a person if you don't know someone's name. But I really didn't want to face that meanness of tone, the absolute absence of any hint of kindness toward someone asking for a tiny bit of help in the form of information. Although she was a complete stranger the encounter stung; the tone seemed so out of proportion to my simple question and I'd been having a really great day up to that point. As I rode I imagined reasons for her to sound so crabby. There's no signage at that point on the Burke-Gilman so maybe she fields a lot of questions and she wishes people would figure out their routes before they get on the trail. This was shortly after we'd had some high wind and maybe she was dealing with downed limbs and clutter and seething about the yard work while I was out enjoying a bike ride (albeit one caused by working on a Sunday). Hey, maybe she's even recently widowed and it used to be her dead sweetheart who dealt with this sort of chore so she's mourning that loss while she rakes leaves. I told myself to forget about her. Regardless of the reasons behind our respective attitudes, I was clearly having the better day. I don't know her story--it could be far worse than anything I imagined or it could be she's just like that to everyone, all the time, in which case she is very, very lonely. Either way, I'll take "Have a nice day!" over "Can't you read?" any day of the week and remember that when I speak, I'm creating a little piece of someone else's world, just for a moment. Periodically I update the archives you'll find under each tab in the navigation above. (Go ahead, take a look--I'll wait.) Then I typically put a note on Facebook or tweet out something along the lines of "Just about everything I've ever blogged, in case you're interested." What I don't do is use the most obvious real estate of all--the actual post space on this blog--to tell you that I do blog prolifically. It just doesn't appear here all that often. This blog houses my most personal stuff, which also means it's the most diverse in topics. If you found me because I've written a lot about biking, you really should look at the Bikes/Transportation tab above and spend more time on my Bike Style blog for my personal take on biking and the Bicycle Alliance of Washington blog for bike policy, events, and other news on everything to do with bicycling in Washington state. If you're interested in just about any other topics, it's bound to come around again but I can't guarantee when. In the meantime, here's a round-up of some of my favorite recent posts from those other spaces. They're all about biking. Surprise! Can you recite a poem from memory? Which one(s)? Why or how did you end up memorizing it? A friend asked on Facebook about what poems people might have committed to memory. That has sparked a great list of entries. For me the answer is "Jabberwocky," by Lewis Carroll. For some reason--lost now in the mists of time--when I was in junior high or high school I thought it would be a great birthday present for Older Brother #3 if I memorized this and delivered it with dramatic flair. Turned out I'd guessed right; he seemed delighted, if somewhat puzzled. I can still deliver chunks of it, although it's not seamless from beginning to end; I may need to brush up on it now, along with the fencing thrusts that go with "One-two! One-two! And through and through! His vorpal blade went snicker-snack. He left him dead, and with his head, he went galumphing back." Then there are the arms thrown wide and the loving embrace that goes with, "'O hast thou slain the Jabberwock? Come to my arms, my beamish boy! Oh frabjous day! Caloo! Callay!' He chortled in his joy." Thinking about this reminded me of Mom and the many poems she had committed to memory as a child, when teachers required kids to memorize and deliver poems before the entire class. When she recited poetry she did so with dramatic flair--could be where I got that. Exaggerated expressions, eyebrows raised high, voice intonation dropping to a whisper where the words called for that. She sometimes did "Little Orphan Annie". All I can remember of that one is the opening line: "Little Orphan Annie's come to our house to stay." One of my favorites was "Hiding," which I had thought was a Robert Louis Stevenson poem included in the book A Child's Garden of Verses, since I remember reading that so many times as a child. Turns out it's by Dorothy Keeley Aldis. "I'm hiding, I'm hiding, and no one knows where, for all they can see is my toes and my hair. And I just heard my father say to my mother, 'But darling, he must be somewhere or other!'" Another favorite was indeed by Robert Louis Stevenson--"The Swing": "How do you like to go up in a swing, up in the air so blue? Oh, I do think it the pleasantest thing, ever a child can do." We had a swingset in the back yard next to the grape arbor that Younger Sister and I played on for hours. I don't remember feeling as if I was going up into blue air, exactly, but I do remember the soaring freedom and pumping my legs as hard as I could to try to get the swing up higher and higher until I shrieked half in fear, half in excitement. My very earliest memory as a child actually involves my mother and poetry, in this case by yours truly. I'm not sure it would be in my memories now if it weren't for the number of times Mom told this story, which makes me think yet again that memories are created primarily through repetition. The memory consists of fragments: Outside in the back yard. Billowing whiteness around me and the whooshing sound that went with it. Blue sky, sunshine, green grass underneath. She was outside hanging sheets on the clothesline while the breeze whipped them around, and I was playing under the clothesline. I paused in my play, looked up, and said, "Oh Mother, oh Mother, what a beautiful day!" Just then the wind died down. I paused, then went on, "The flowers are blooming and the wind's gone away!" Mind you, the idea that a toddler addressed her mom as "Mother" sounds a trifle over the top to me. That's something that happens in books about well-bred English children, not a kid in the back yard of a house outside of Lewiston, Idaho, surrounded by wheat fields. On the other hand, I've always loved language and playing with words. If I had recently been told that "Mother" was another label for my mom I could well have been playing with that word, testing it out as something I could call her instead of Mommy. She both read and recited to us a great deal so the possibility of me being able to put together a rhyming phrase doesn't surprise me. 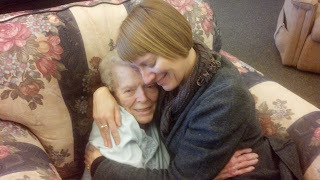 Mom speaks only Jabberwocky now, and constant repetition was one of the early signs of her dementia as it developed. But when I was a child and she recited poems to me I marveled at the power of her memory.